Michael Thonet was born on 2 July 1796 in Bopard-am-Rhein, Prussia (present day Germany). Quite fittingly he started life near the start of the industrial revolution. He would go on to form a company and pioneer mass production, both attributes of this new industrial era. He trained as an apprentice cabinet maker in his home town. After his apprenticeship, he began almost immediately to experiment with bentwood and veneers in furniture. In 1842, Thonet was invited to Vienna by the Chancellor of Austria to do some of the furniture for the Palais Liechtenstein. His work was still very experimental at this point but displayed an innovative spirit which attracted the Chancellor. Despite being invited to become the official furniture designer to the throne of Austria, Thonet chose to remain independent. He had set his sights on a larger audience. 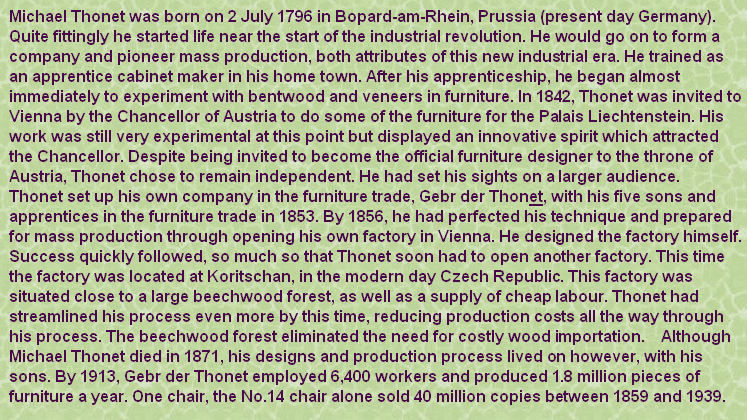 Thonet set up his own company in the furniture trade, Gebr der Thonet, with his five sons and apprentices in the furniture trade in 1853. By 1856, he had perfected his technique and prepared for mass production through opening his own factory in Vienna. He designed the factory himself. Success quickly followed, so much so that Thonet soon had to open another factory. This time the factory was located at Koritschan, in the modern day Czech Republic. This factory was situated close to a large beechwood forest, as well as a supply of cheap labour. Thonet had streamlined his process even more by this time, reducing production costs all the way through his process. The beechwood forest eliminated the need for costly wood importation. Although Michael Thonet died in 1871, his designs and production process lived on however, with his sons. By 1913, Gebr der Thonet employed 6,400 workers and produced 1.8 million pieces of furniture a year. One chair, the No.14 chair alone sold 40 million copies between 1859 and 1939.
is the designers responsibility to see that this is possible - by understanding processes and materials. Following Thonet’s patent expiring many copies and variants were designed and made.